Supermarket chain Morrisons is to start selling paper shopping bags in all its stores from May following customer concerns about plastic use. The UK's fourth-biggest grocer will roll out the paper bags in Wales next week, followed by England and Scotland. It said the scheme will take 1,300 tonnes of plastic out of the environment each year. But question marks hang over whether paper bags are more environmentally friendly than plastic ones. 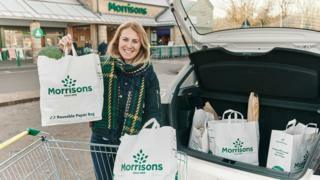 Morrisons has been trialling selling paper bags alongside plastic reusable carrier bags in eight Welsh stores. It will start selling both types for 20p, having phased out 5p carrier bags in the past year in England, Wales and Scotland. The supermarket chain does not have any stores in Northern Ireland. Morrisons marketing director Andy Atkinson said: "We are taking another meaningful step that will remove an estimated 1,300 tonnes of plastic out of the environment each year. "Our customers have told us that reducing plastic is their number one environmental concern so introducing the paper bag across the nation will provide another way of reducing the plastic in their lives." Analysis by BBC Reality Check in January looked at the effect paper shopping bags can have on the environment. It looked at a research paper written for the Northern Ireland Assembly that found manufacturing paper bags uses more than four times more energy than making plastic bags. Forests, which absorb the greenhouse gas carbon dioxide, need to be cut down to make paper. In 2011, an Environment Agency report found that to have less of a global warming impact than conventional single-use plastic bags, paper bags needed to be used three times. This raises the question of whether paper bags would last long enough to be reused that many times, especially if they split or get wet. Morrisons said its paper bags were strong enough to carry up to 16kg, or more than 14 standard wine bottles. "The amount of times a customer can reuse the bags depends on how the bag is treated but there is no reason that this bag cannot be reused as many times as the plastic one it is replacing," a spokeswoman said. "We have carried out testing on these bags with our colleagues and people have already been re-using them for a few months with no issues," she added. Morrisons had been "very careful" to ensure that its paper bags, which are made in Wales, had the same carbon footprint as its reusable plastic bags. The spokeswoman said that the paper bags, along with its plastic bags, were recyclable. Its 20p plastic bags are made "using plastic waste collected from the back of our stores and depots". "We are the only UK supermarket to do this," the spokeswoman said. Margaret Bates, professor of sustainable wastes management at the University of Northampton, said that charging people for bags could make them think twice if they actually needed them. "Hopefully making people pay will encourage them to use the bags as much as possible and then this will reduce the environmental impact of the bags and encourage better behaviours," she said. Louise Edge, head of Greenpeace UK's ocean plastics campaign, said: "If these new paper bags really are 'bags for life' and not just a throwaway paper alternative then this is welcome news. "Embracing the reuse revolution really is the best way to ensure we tackle our plastic problem without sacrificing our forests." Plastic or paper: Which bag is greener?